Andy Note: It appears as of January 2018, the Cookie Butter Bar is back, but under a new moniker, The Cookie Crumble Bar. I’m not sure if it is exactly the same, but it sure tastes like it. Maybe they got rid of the “butter” part so it doesn’t sound so unhealthy? We’ll see if it goes away again come March. On the coffee front, or should I say the “latte” front, I’ll admit I’m a Starbucks man. My drink of choice is the venti, iced, non-fat latte, even in the winter. I’ll also admit that I am wont to sometimes peruse the food case looking for maybe a brownie or chocolate chip cookie. I understand it’s not the best of food choices, but every now and then a sweet treat is in order, and one of those usually fits the bill. It was my wife who told me about this bar of wonder. Me, I’m a creature of habit, and even though I pride myself on being observant when things are different, for whatever reason there are times, say if there were a lion sitting in the corner of the Starbucks, I wouldn’t notice it as my focus would be “Do they have any cookies or brownies? Yes!”, followed by order time. My wife, on the other hand, will look for new things. One day she told me she found the most glorious of treats, and that she was lucky enough to get one because the barista told her they sell out quickly. Three Words. Cookie Butter Bar. 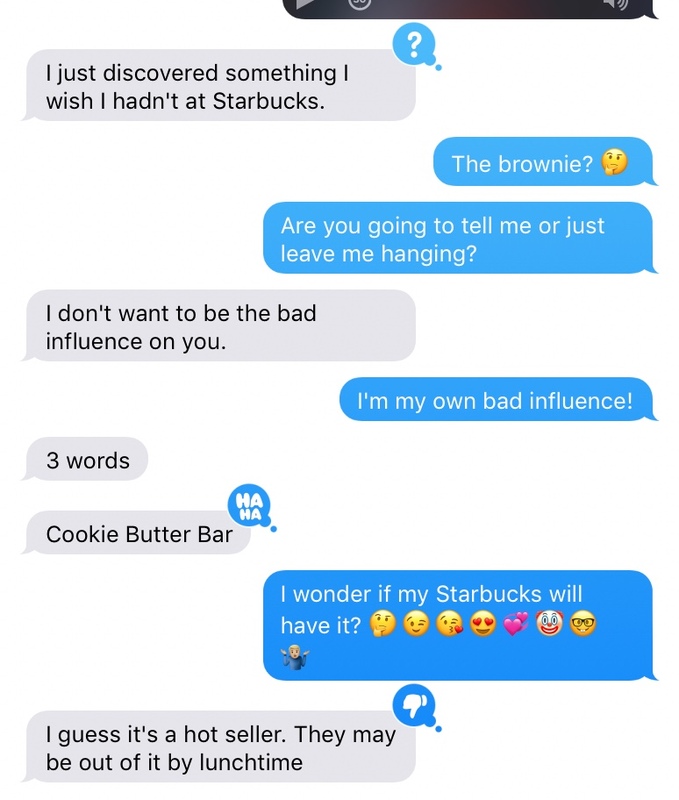 No more brownie for me, nope, I have one love, and one love only in the bakery area of the food case at Starbucks, the Cookie Butter Bar. 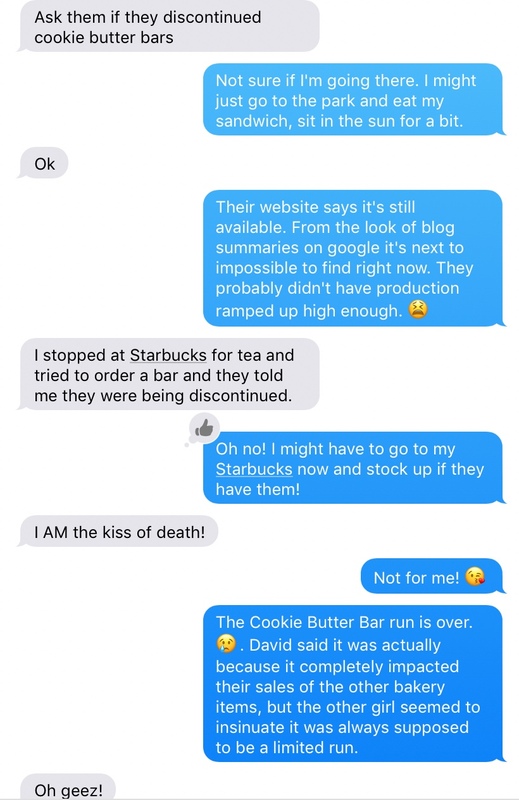 Yes, the Cookie Butter Bar was incredibly popular, and on my next trip to Starbucks they were nowhere to be found. Okay, absence makes the heart grow fonder I figured. On the weekend morning my wife and I were in luck as we could share the “Wow, these are awesome!” together. A challenge to find, but worth the quest. Then the work week started. My wife visited her Starbucks and texted me that she heard something disturbing from her barista, “they were being discontinued.” I told her they must have just been messing with her. Why would they get rid of the best thing they have ever sold? I felt secure that, at “my” Starbucks, I would have no difficulty in securing tasty goodness. The girl barista simply explained that like a cranberry bar they used to have, the Cookie Butter Bar was destined to be a seasonal, Spring item, and once gone they were gone. The dude barista went on this explanation of there were only so many people in the world, each eating so many meals a day, and that there just wasn’t room for people to eat the Cookie Butter Bar because it took away from their brownie and normal cookie sales. I believe I was going along with the girl barista, but kudos to him for the most convoluted explanation of my sadness, ever. How? 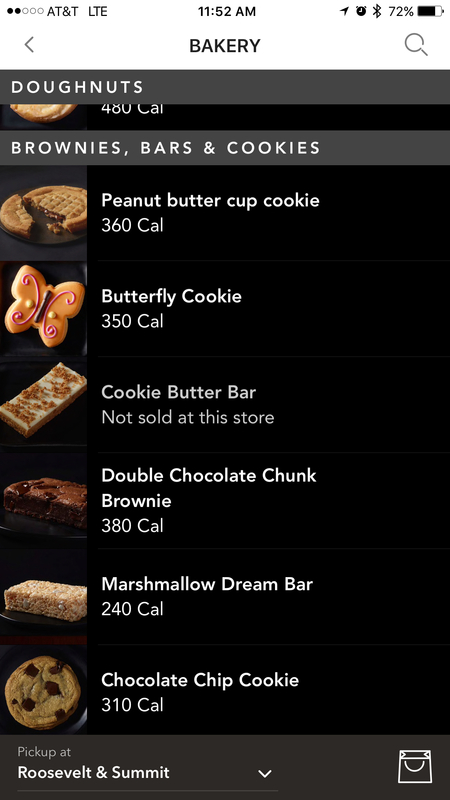 How could Starbucks only make like five of these scrumptious bakery items per store, I mean, it must be like five because no one has them? My dreams are now haunted with the memory of the Cookie Butter Bar. I mean, really, Starbucks, you have a “Spring” bakery item that doesn’t even last a month? What kind of Spring is that? Who planned this? This is the “Spring of Discontent!” Heck, they still have the other Spring items, which people obviously don’t like as much, but were brownie sales that important that you had to get rid of the Cookie Butter Bar? It is said that it is better to have loved and lost then never have loved at all, or some crap like that, and maybe I should take some solace knowing I was one of the lucky ones, I was able to have not one, but two of the most delicious bakery items Starbucks has ever sold, but dammit, in this case, never having loved the Cookie Butter Bar at all might be better.